Can you pronounce Huawei? I won't judge if you can't or have never seen that word before. It's the name of an electronics company that makes smartphones, among other things, but is more well known in Asian and European countries. Also, it's pronounced who-a-whey. Why is that important? 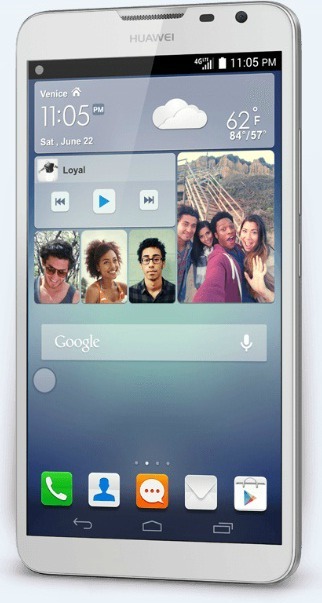 Because Huawei flagship phones are coming to the US, starting with the Ascend Mate2 4G LTE. You can pre-order this 6.1-inch phablet for an amazingly low $299 off contract. The Ascend Mate 2 is a big phone. A really big phone. That in itself is not a terrible thing, but those of you who often use your smartphone one-handed, this device is not going to work for you. It does have a one-handed mode that is supposed to help by shoving the keyboard and the dial pad more to one side of the screen than the other. That doesn't address the physical limitations. Huawei is not alone in this; one-handed mode is not that useful on the Galaxy Note 3 or the LG G Flex, either. If you're like me and use two hands most of the time this isn't as much of a problem. Despite the size, the Mate is relatively light and slim. It balances well and I didn't feel in danger of it tumbling to the floor all the time. But I have medium-sized hands. If your hands are small you may not even be able to hold the Mate comfortably in one hand while tapping the display with the other. For big screen aficionados that aspect is less important than having . The 6.1-inch screen is roomy giving you plenty of room for reading, framing shots, and maybe taking notes, but there are drawbacks. The first is the 1280 x 720 pixel resolution. At this size a larger 1080p display is so much crisper, and people are used to a higher pixel density. The 720p screen is likely one of the ways Huawei kept the price down, and the resolution in itself is not terrible. The Gorilla Glass 3 display is bright but colors don't pop. Viewing angles are wide enough that you don't need to keep the phone in one position to hit the sweet spot, but you'll notice darkened and occluded colors when playing games like Temple Run 2. The speaker on the back produces decent volume, most of which is lost when watching videos. Like all the other big players, Huawei also created a UI skin for Android to differentiate its phones from others. This one is named the Emotion UI and it changes some key aspects of Android for no real reason. The biggest change is that there's no separate app list. The Home screens are where all apps reside, just like the current version of the iPhone. You can create folders and organize apps the way you want, but this may confuse or annoy Android veterans. Also, all the icons are square, even when the developer doesn't make them square. Samsung used to do this and they stopped for a reason (it looks weird). A skin should make Android easier to use and be attractive and a joy to look at--Emotion UI doesn't quite get there. Under the hood, the Mate 2 runs on a quad-core processor with 2GB of RAM. Performance is speedy and smooth, and I noticed no hiccups or lag when playing games or streaming video. At the base price you only get 16GB of internal memory, and the microSD slot only takes cards up to 32GB. If you play a lot of games you could run out of space fast. Though I have not yet had a chance to test it, I'm impressed that Huawei built in some of the fastest LTE capabilities into this phone to future-proof it. The Mate runs on GSM networks (AT&T and T-Mobile in the US) and has a category 4 LTE radio inside, meaning it's capable of 150 Mbps on networks that support that. In addition, it has a dual-band a/b/g/n/ac Wi-Fi radio and Bluetooth 4.0. One key selling point of the Mate 2 is the giant battery inside. The 3900 mAh capacity battery can power the phone for several days with light usage and over two days with heavy usage. Since that's more juice than most people actually need, the Mate can also act as a backup battery for other devices. Anything that can be charged via micro USB--cameras, Bluetooth headphones, music players, other phones, etc.--you can charge with this phone and a special cord (sold separately). It's nice not to have to worry about running out of battery life with a big screen phone. The 13 megapixel camera on the back of the Mate 2 is capable of taking crisp and color correct photos. It's just not so easy to do so. The shutter seems faster than it is, and it's hard to get non-blurry shots when people move even a little. The camera struggled to take close up macro shots and overall the auto focus isn't as good as the LG G Flex or the Galaxy Note 3. The front-facing 5 megapixel camera is better than average--I easily fit five people into a group selfie and, in good light, the resulting photos are good enough that I didn't need Instagram filters. At $299, it seems odd to call a phone a "bargain," especially when most phones cost $199 up front. However, that $199 is almost always a contract price and usually not for phablet-sized devices. For an off-contract smartphone of this size, $299 is a decent deal. You just won't get a premium device for it. You will get a speedy phone with a big screen that can handle any app and will last you for days. People who don't like being tied to contracts now have another viable choice from a company that has a solid reputation and track record. The Ascend Mate2 is only available online right now at GetHuawei.com. That's also the place to get accessories (there are cases!) and special offers, find community, and look for support when you need it. Order the phone now through June 22nd and you'll get a free Net 10 SIM card and one month of service.